Rev Stuart Davidson, the pioneer minister for Ferguslie Park and north Paisley, spoke to Kenneth Speirs of the Paisley Daily Express about his new drop-in centre for drug addicts and others who may feel excluded from society. A Paisley minister is on a mission to support drug addicts and people feeling isolated in their communities. And he has taken his cue for a new drop-in service from the barnstorming preacher who gave the address at Prince Harry’s wedding. Rev Stuart Davidson, who is the Church of Scotland’s ‘pioneer minister’, starts a project next week in Ferguslie Park for drug addicts and others who may feel excluded from society. And Mr Davidson said the message that the Most Rev Michael Curry put across to an audience of more than a billion when he spoke at the Royal Wedding about the power of love was spot on. “The power of love, there is power in embracing people, welcoming them back into the community,” he said. “And as hard as it is for them, as much of a background as they have, drugs or whatever, the truth of the matter is how else are they going to get out of it? The new service will take place every Tuesday morning at the Tannahill Centre and will be open to everyone from drug addicts to the lonely. “Basically, as Christians we believe that God loves us dearly and wants to welcome us back,” Mr Davidson said. “One of the things about Jesus’ stories that he often told and the examples he gave – people’s lives that he helped – were about people who were outcasts and people who were welcomed back into the community. During his time working in Ferguslie, Mr Davidson has seen people gather in “huge numbers” to receive methadone doses at the chemist’s shop in the Tannahill Centre. And every one of them will be welcome at the drop-in. “They are invited warmly,” he said. “Open arms will also welcome the lonely, unemployed, people in debt – anyone at all,” Mr Davidson added. 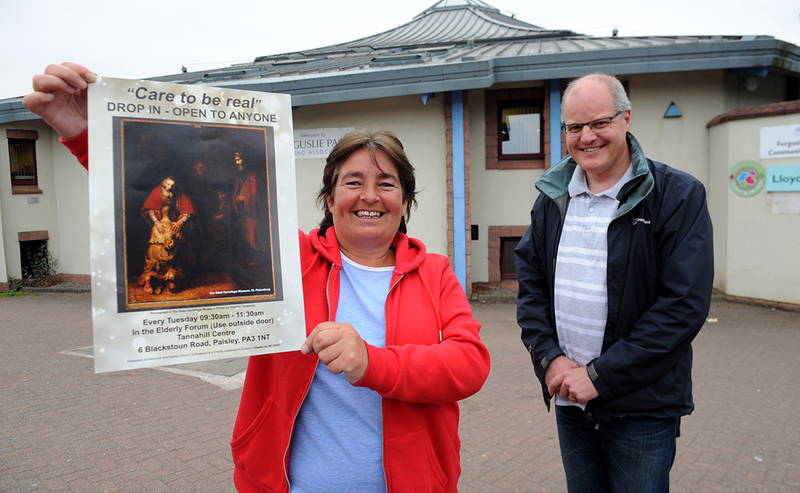 Helping at the new drop-in is Ferguslie woman Linnie Hendry, 49. “I lived here and moved back last year” she said. “And since I’ve come back, in Feegie it’s like someone has put out the light and shut the door. “This will be somewhere they can go and they can sit. It will be somewhere to call their own and come and sit. The new service will run every Tuesday from 9.30am to 11.30am at the Elderly Forum premises in the Tannahill Centre.